Teeth whitening kits can cause a variety of problems. Problems can occur in accidentally swallowing the bleaching product, faster decay, and damaging gums. The peroxide used in teeth whitening can cause damage to the nerves and the fleshy tissue in your gums. When the nerves are damaged, you will have an increased sensitivity to hot and cold sensations. Laser teeth whitening is not much better; the peroxide is still applied to the teeth, only this time the laser causes it to penetrate more deeply into the tooth. Laser teeth whitening can cause even more damage than just applying a tooth-whitening product to the surface. These problems, if left untreated can lead to tooth decay and in rare cases sometimes loss of the tooth altogether. The mouth is a very sensitive area of the body. The harsh chemicals involved in teeth whitening should be a last resort after you have tried over the counter treatments such as toothpaste. However, there are a few precautions you can follow to ensure that the whitening process goes smoothly. First, if you have any current problems with your teeth, wait until they are taken care of by a dental professional before whitening your teeth. Never start the process with open wounds in your mouth, such as stitches or ulcers. This can lead to worse problems than you started with, and the chemicals can eat away at the tissue and cause a great deal of pain. 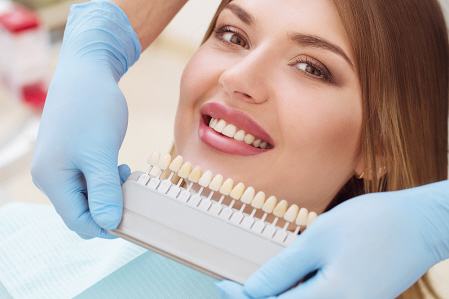 An alternative to chemical teeth whitening is having veneers put on your teeth. Many patients have opted to go this route, despite its cost, and have been very pleased with the results they have achieved. In addition, many celebrities achieve their seemingly perfect smile through veneers rather than chemical teeth whitening. These will remain white and are not porous like your regular teeth. They come in a variety of materials and while they do tend to cost more than teeth whitening treatments, the upside is they last a great deal longer than the results you achieve from a chemical tooth whitening process.